A senior Iranian prosecutor said Sunday that authorities will release an American woman on $500,000 bail because of health problems, more than a year after she was jailed with two other Americans and accused of spying. 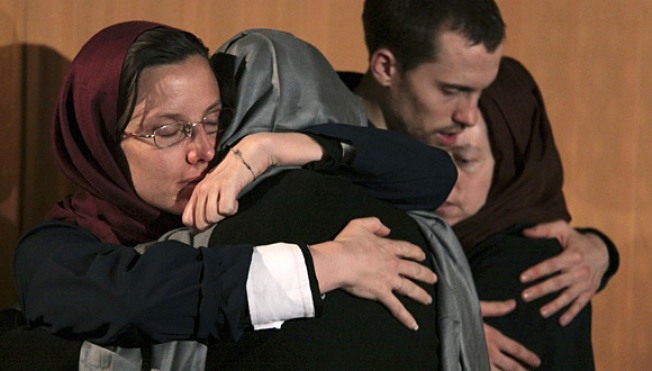 The news came during a weekend of start-and-stop announcements about the release of Sarah Shourd, who was detained with two friends, Shane Bauer and Josh Fattal, along the Iran-Iraq border on July 31, 2009. Shourd's mother has said she has been denied treatment for serious health problems, including a breast lump and precancerous cervical cells. There were no details on when she would be released, and it was also unclear if the bail announcement meant she would be free to leave the country or would have to remain in Iran to stand trial. "Based on reports and the approval of the relevant judge about the sickness of Ms. Shourd, her detention was converted to $500,000, and if the bail is deposited, she can be released," the official IRNA news agency quoted prosecutor Abbas Jafari Dowlatabadi as saying. He said the decision has been relayed to her lawyer. Reached by telephone, her lawyer, Masoud Shafiei, refused to make any immediate comment on the announcement. Shourd, who has been held in solitary confinement, was to have been released Saturday as an act of clemency to mark the end of the Muslim holy month of Ramadan after the intervention of Iran's president, Mahmoud Ahmadinejad. But the judiciary abruptly halted that planned release, indicating such a decision would have to first go through the courts. Iran has accused the three Americans of illegally crossing the border and spying in a case that has deepened tensions with Washington - which has led the push for tougher sanctions on Iran over its nuclear program. Their families say the Americans were hiking in Iraq's scenic north and that if they crossed the border, they did so unwittingly. The prosecutor said the two other Americans would remain in custody. Dowlatabadi added that the prosecution's cases against the three were nearly complete and that a judge has issued indictments for all three on charges of spying. The judiciary appeared to be using the case to flex its muscles in an internal tussle with President Ahmadinejad. On Friday, the Foreign Ministry had announced that plans for her release on Saturday were the result of Ahmadinejad's personal intervention and reflected the "special viewpoint of the Islamic Republic of Iran on the dignity of women." Hours later, judiciary officials said the release was off - an embarrassing rebuke to Ahmadinejad that also dashed the hopes of Shourd's family. On Saturday, Dowlatabadi emphasized that any announcement about the American's release "would only come through the judiciary system." The mixed signals point to one of the main fissures in Iran's conservative leadership: Ahmadinejad and his allies against the powerful judiciary overseen by Iran's supreme leader. In the past year, Iranian authorities have allowed bail or converted jail sentences to fines for two other high-profile detainees. In May, French academic Clotilde Reiss was freed after her 10-year sentence on espionage-related charges was commuted to a fine equivalent to $300,000. Canadian-Iranian journalist Maziar Bahari of Newsweek was freed on $300,000 bail in October 2009 after nearly four months detention following the crackdown after the disputed presidential election. He was later sentenced in absentia to more than 13 years in prison and 50 lashes.